Yang jang pi is another popular Chinese influenced dish served as an appetizer at Chinese/Korean restaurants. It's great party dish where fresh vegetables are thinly sliced and neatly placed around a large plate with sautéed noodles, seafood, beef and/or pork placed at the center. Assortments of seafood that are usually found in this dish are shrimps, squids, sea cucumbers, and imitation crab meat. And assortments of vegetables can include but not limited to carrots, mushrooms, cucumbers, garlic and ginger. All ingredients are usually mixed together and tossed tableside with a hot mustard-based sauce made up of yellow wasabi and other fresh ingredients. As an optional step, soak salted jellyfish in cold water for 1 hour. Drain and set aside. Make hot mustard sauce by mixing all ingredients together until it turns completely liquid. Strain any tiny bits and pieces left over from wasabi and/or peanut butter. Refrigerate. Clean squid and cut into bite-size pieces. As an optional step, clean sea cucumber and cut into bite-size pieces. Boil water in pot and cook shrimp for approximately 1 minute to 90 seconds, depending on size. Feel free to use a mini strainer. Slice in half and set aside. Boil squid for approximately 1 minute in same boiling water. Rinse once more in cold water and drain. Set aside. As an optional step, boil sea cucumber for approximately 2-3 minutes in same boiling water. Rinse once more in cold water and drain. Set aside. Julienne cut cucumbers, and carrots. Carefully tear imitation crab meats into thinner strips. Separate egg yolks and whites. Pan-fry yolk only in low heat. Discard egg whites or feel free to include them but pan fried separately. Spreading egg contents wide around pan is best. Once both sides are cooked, julienne cut. 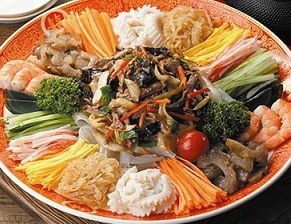 In a large serving plate, neatly arrange prepared vegetables and seafood around a plate much like in the picture above. Once complete, refrigerate for 30 minutes for optimal taste. Boil water in pot and cook noodles for 4-5 minutes. Drain and cool. Thinly slice onion and mushrooms. Mince ginger and garlic. Add oil to frying pan and sauté beef or pork in high heat for 3-4 minutes. Add noodles, onions, mushrooms, ginger, garlic, soy sauce, sesame oil, and cooking wine. Stir-fry for additional 2-3 minutes. Sprinkle salt and pepper to meet taste. Take out vegetable plate out of the fridge and place sautéed ingredients in the middle. Pour hot mustard based sauce over right before serving. Add less to control spiciness. Mix and toss all ingredients together.